How many U.S. states are composed entirely of islands? A constitutional right to reject. The exercise of a veto. Is 'Freedom of Religion' part of the Bill of Rights? In what year did Martin Luther King, Jr. give the "I Have a Dream" Speech? In what year did the U.S. purchase Alaska from the Russian Empire? In what year was Alaska admitted as the 49th state? In what year did Hawaii receive statehood? And finally, how many U.S. Senators are there? 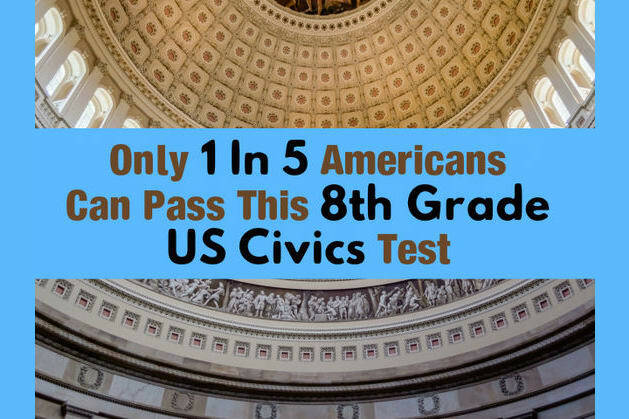 You passed an 8th grade US Civics Test that only 1 in 5 Americans Can. You are passionate about knowledge and history, make connections between past and present, and tend to raise the intellectual bar. You must be a phenomenal storyteller and a dependable listener. Way to go! Well, 4 in 5 Americans can’t pass this test. It’s time to hit those history books!